A total of 333 rhinos were illegally killed in South Africa in 2010, including ten critically endangered black rhinos, according to national park officials. The yearly total is the highest ever experienced in South Africa and nearly triple 2009 when 122 rhinos were killed in the country. An additional five rhinos have been lost to poaching since the new year. Kruger National Park, the world famous safari destination, was hardest hit losing 146 rhinos to poaching in 2010, authorities said. The park is home to the largest populations of both white and black rhinos in the country. Rhinos constitute one of the much-revered “Big 5” of African wildlife tourism, including elephants, lions, leopards and Cape buffalo. Rhino poaching across Africa has risen sharply in the past few years, threatening to reverse hard-won population increases achieved by conservation authorities during the 20th century. 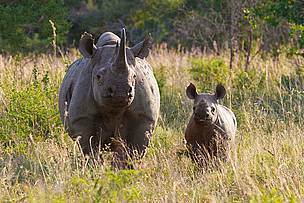 The first alarming yearly spike occurred in 2008 when 83 rhinos were lost. South Africa has responded by intensifying its law enforcement efforts, and made approximately 162 poaching arrests last year. “Many more successful convictions, backed up by appropriately daunting penalties will significantly demonstrate the South African government’s commitment to preventing the clouding of the country’s excellent rhino conservation track record that it has built up over the past several decades,” said Dr. Morné du Plessis, CEO of WWF South Africa. The current wave of poaching is being committed by sophisticated criminal networks using helicopters, night-vision equipment, veterinary tranquilisers and silencers to kill rhinos at night while attempting to avoid law enforcement patrols. The recent killing increase is largely due to heightened demand for rhino horn, which has long been prized as an ingredient in traditional Asian medicine. It has been claimed recently that rhino horn possesses cancer-curing properties, despite there being no medical evidence to support the assertion. “Only a concerted international enforcement pincer movement, at both ends of the supply and demand chain, can hope to nip this rhino poaching crisis in the bud,” said Tom Milliken, Director of TRAFFIC’s East and Southern Africa programme. Milliken pointed to recently established coordination links between officials in South Africa and Vietnam, the country heavily implicated in the recent poaching surge. South Africa is home to approximately 21,000 rhinos, more than any other country in the world. Black rhinos are listed as critically endangered with only about 4,200 remaining in existence, according to the International Union for Conservation of Nature (IUCN). Approximately 1,670 black rhinos were believed to be living in South Africa in 2009. The country's other resident species, white rhinos, are classified as near threatened on IUCN’s Red List of threatened species. “The recovery of African white rhinos from less than 100 in the late 19th century to more than 20,000 today is a phenomenal conservation success story that can largely be attributed to the combined efforts of South Africa’s state and private conservation authorities. Consumers of rhino horn across Asia, and in Vietnam in particular, are now seriously compromising this achievement by motivating criminal groups to kill rhinos. In order to halt this massacre, substantial resources need to go into law enforcement, both in Africa and in Asian consumer countries where all trade in rhino horn is illegal," said Dr. du Plessis. In South Africa, WWF’s Black Rhino Range Expansion Project aims to increase the overall numbers of black rhino by making available additional breeding lands. This is done by forming partnerships with owners of large areas of natural black rhino habitat. So far, 98 black rhino have been translocated to new range lands and at least 26 calves have been born on project sites. In December 2010, South Africa’s Eastern Cape Parks and Tourism Authority committed to donating 20 black rhino to the project in an effort to aid South Africa in reaching its national target of 5,000 black rhinos. In October 2010, TRAFFIC facilitated a visit of five South African officials to Vietnam to discuss strategies for combating the illegal rhino horn trade. TRAFFIC, the wildlife trade monitoring network, is a joint programme of WWF and IUCN. Click here for latest news and media resources.